The primary goal of adverse event reporting is to help an institution prepare sensible and robust solutions to such kind of possible occurrences. Albeit the researchers may not report the clinical problems immediately after their research assignment is complete, it’s often important to conduct this investigation only a few days after the clinical research. It is important to understand that adverse events almost always place researchers and the research subject at greater risks, and, therefore, you need to take this situation seriously by conducting an adverse event assessment. 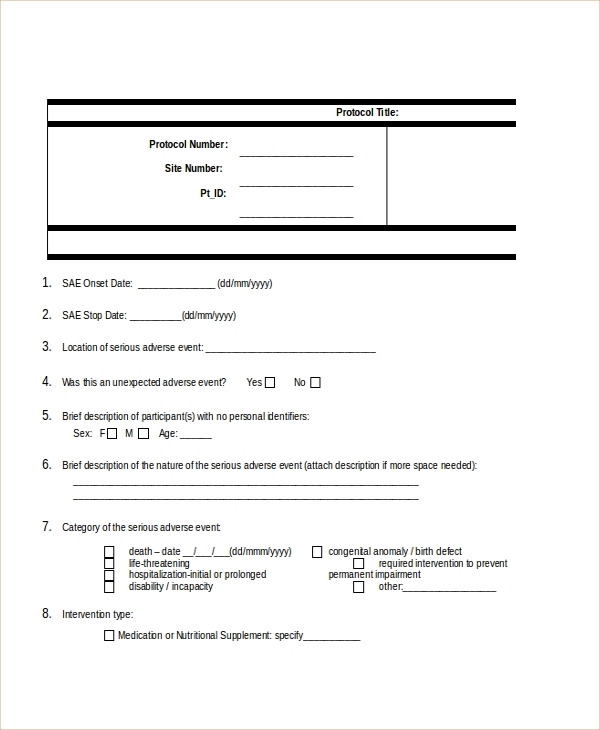 Use this form to record the specific events “AS IS” without compromising one for the other. This way, you will be able to understand the impact of any clinical test under study. Unanticipated problems may necessitate a change in your research subject, but it’s best to analyze the current event to determine if the subject under study is worth further investigation. That’s the goal of this form. Cioms studies are somewhat complex, so you should think of digging deep into the research, and at the same time, investigate the adverse events. 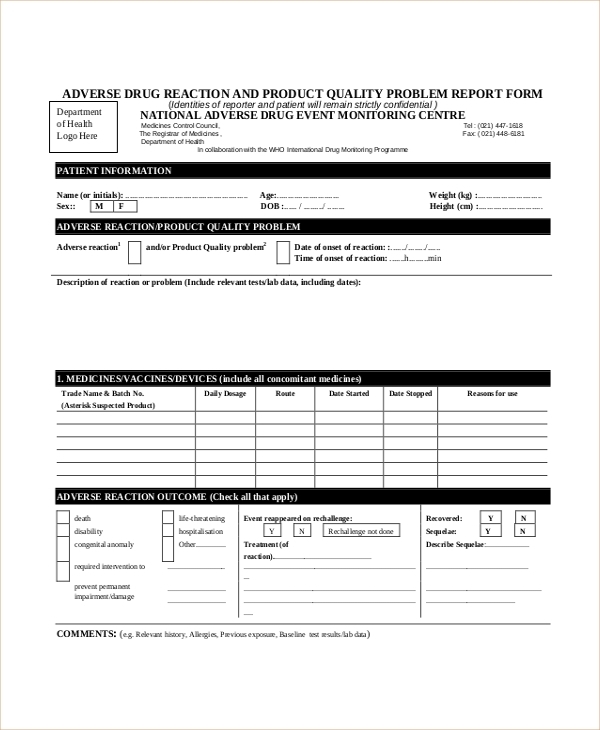 You can record the results on a Cioms adverse event form. 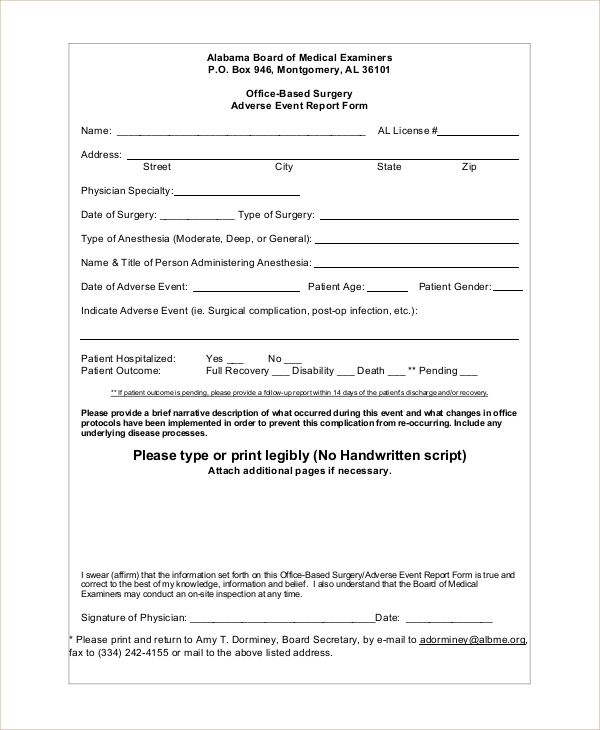 If surgery is the subject of investigation and you would like to conduct an adverse effect study, use this form. Record as much info as you can, and then write a report based on your findings. The reason for the analysis is to determine the exact effect of the subject under study. Of course, the topic under investigation can be anything, but you must know what the topic is before you start. The subject under investigation here must not cover pre-existing conditions. It is highly likely that such conditions will remain constant during and days after the investigation. 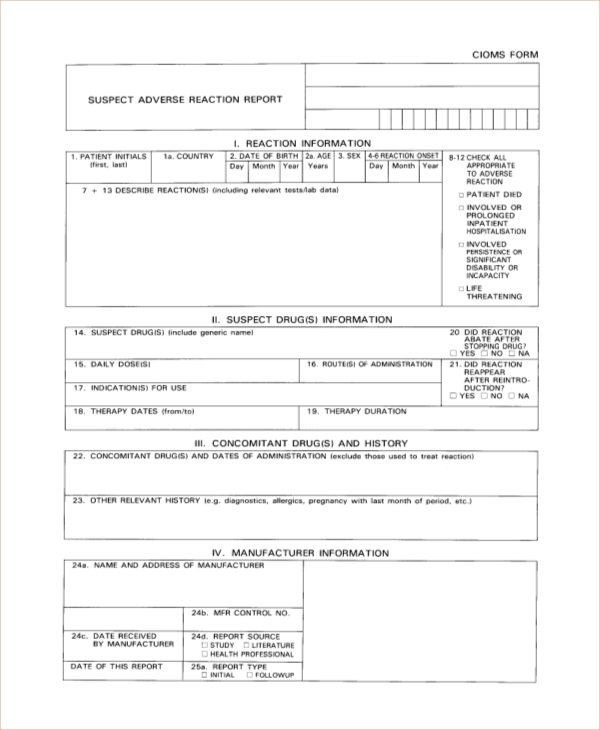 Download the form for free. 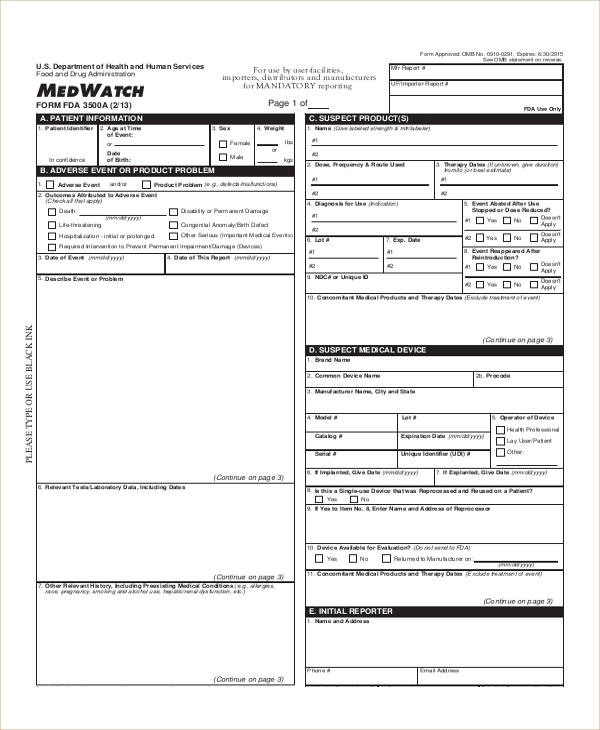 Use this form to investigate the effects of a drug on patients. Conduct the study carefully because the results must be accurate. 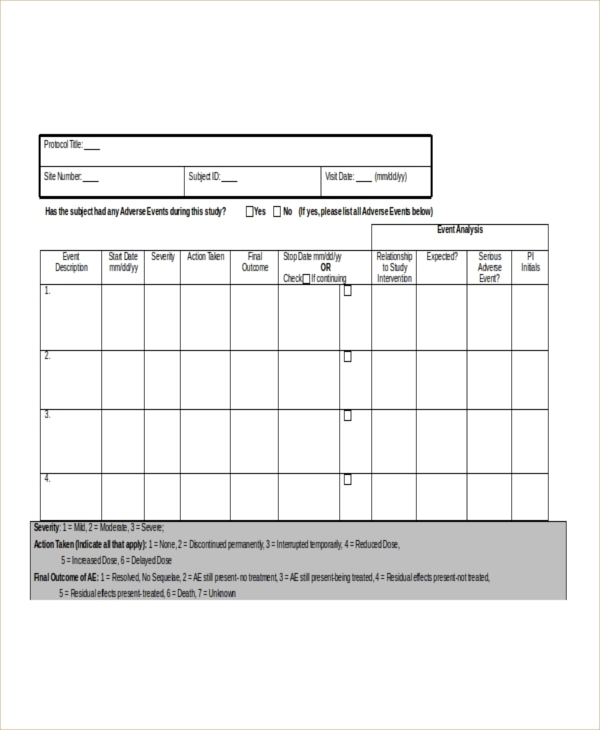 Use the data on the form to write a report with regard to the results. An adverse effect is an occurrence in a clinical investigation where the subject under study is a pharmaceutical product, but the clinical research sometimes doesn’t have any causal relationship with any treatment. It’s not easy to determine the exact cause of an Adverse Event, but many clinical researchers believe that the effect may be associated with the use of a drug although it can be difficult to conclude whether the event is related to the human drug used or not. Adverse events can be suspected, serious, unexpected, or unanticipated problems. Moreover, some adverse effects often occur because of research misconduct, and violation and deviation of clinical investigation guidelines. What’s The Exact Nature of an Adverse Event? The event was unforeseen and unexpected. The event has a close link to the subject under investigation, regardless of the argument that there might never be a relationship. The event caused harm to the subject. Are Adverse Events Internal or External? They could be both. Internal events are those that occur at your site. Health-care investigators, patients, and health-care providers at your site will provide accurate information about the occurrences. External events aren’t related to your site at all, but it is important to understand that they affect a different site that’s participating in clinical research. It is unfortunate that many investigators don’t often know about the occurrences of these events, especially because they are often more concerned with the subject under study. As such, it would be best if they stay in touch with all the sources of information that can help them understand the events. The subject of adverse events seems somewhat complicated, but it shouldn’t take you long to get your head around it. 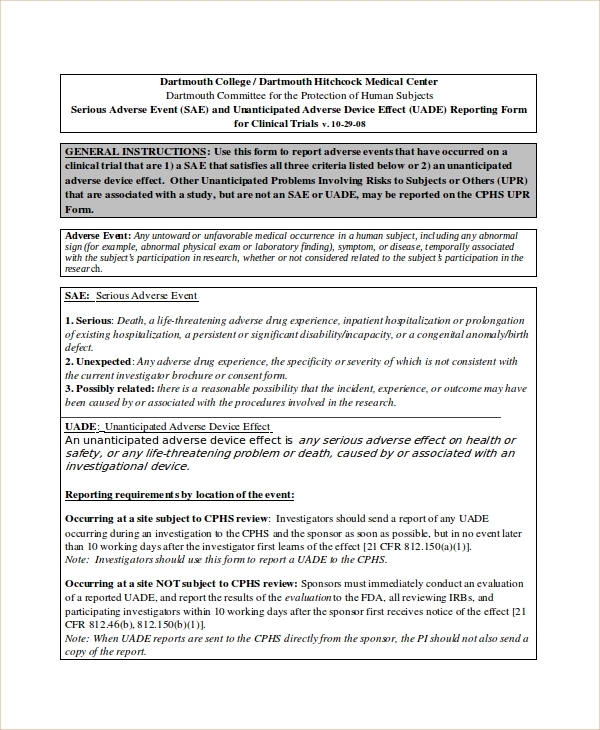 Of course, there are many causes of the events, and the best way to understand each one is to use the adverse events form to conduct your investigation. The forms are free to download, edit, and use.